Certifying a diamond is an intricate process. It involves the diamond being graded by a gem laboratory based on the four Cs used to assess diamond quality, in order of Cut, Colour, Clarity and Carat Weight. The highest possible grading for a diamond is zero, and the lowest is ten. So for example, if a diamond possesses only a small amount of colour, then it will be given a lower grading number. This in turn will make it more expensive to purchase due to its rarity. When a diamond has the finest cut, is entirely colourless, is free of blemishes and weighs one carat, it will receive a score of three zeroes and be graded as one carat – the perfect diamond. A half-carat certified diamond that receives a perfect score will cost less due to it being smaller and lighter in weight than a one carat diamond. Diamond certifications are independently assessed by gem laboratories, this is good news for you, because it means you won’t need to solely rely on the word of a salesperson about that particular engagement ring that has set your heart aflutter. The certificate that accompanies the ring will tell you all you need to know. The most well-renowned laboratory in the world is the Gemological Institute of America (GIA). At Koro, we use GIA certification on all our diamonds, as well as working with other respected laboratories such as the Australian Diamond Grading Laboratory (ADGL). So what is the difference between a certified and a non-certified diamond? Firstly, a guarantee from an independent assessor that you will be getting exactly what you pay for. Unless you are a gem expert in possession of a loupe, most people wouldn’t know what to look for when it comes to purchasing a diamond, or even if it is a bona fide natural diamond in the first place. Secondly, security on an investment. Make no bones about it, diamonds are expensive, and you want to make sure that your exquisite piece of custom jewellery is going to hold its value for generations to come. 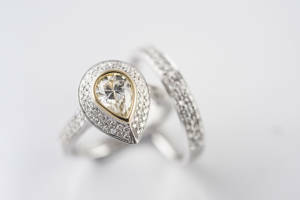 In addition, if you ever wish to sell it, a certified diamond will give you a far better return than an uninsured one. And if you have the misfortune of losing it, rest assured your certified diamond will be covered by your insurer for the full amount, if not more. The purchase of a diamond is no small thing. Here at Koro, we have a fully-qualified gemmologist who carefully monitors all aspects of the diamonds we supply, ensuring that your certified diamond investment will stand the test of time.